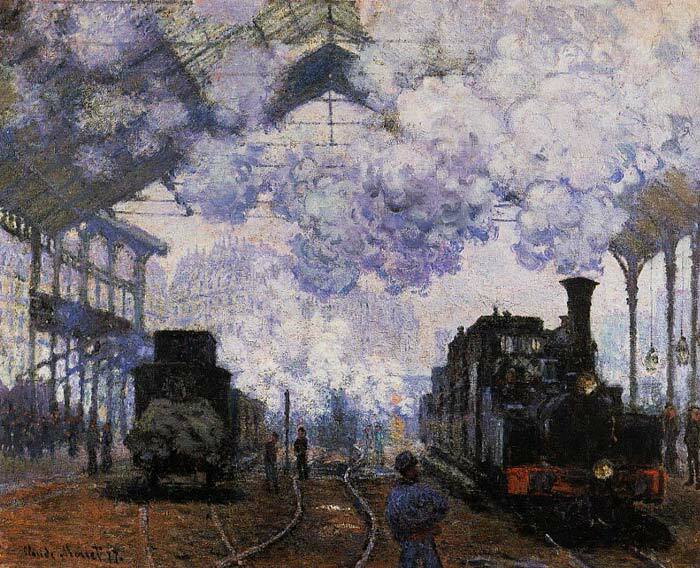 When Monet (Moh-NAY) decided to paint the trains at Saint-Lazare Station, he put on his best suit, fluffed out his ruffled cuffs brought along a gold-tipped cane, presented his card to the station-master and announced his intention to paint there. Impressed with his grand appearance, the station-master not only gave Monet permission to set up his easel on the platform and in the train yard hut also instructed the engineers to mit trains in and out of the station as often as Monet wished, clear the platforms, arid load the engines with coal to make them generate as much smoke as he desired. SPECIAL NOTE : The painter will make the reproduction as close to the original oil painting as possible. If you want your painting to alter from this likeness, please email us and " Arrival at Saint-Lazare Station , 1876	" will be reproduced according to your special requirements.